Book – Non-fiction. By Pamela M Tuck. Illustrated by Eric Velasquez. 2013. 32 pages. Based on her father’s experience in 1960s North Carolina, Pamela Tuck tells how a family and community challenge racism where they work, shop, and go to school. The protagonist, 14-year-old Mason, is the letter writer for the local African American civil rights committee. In appreciation, they give him a typewriter. His typing skills help him open doors when he attends the formerly all-white high school. There is no sugarcoating of the racism Mason faces. In fact, when he wins a county typing competition, not one audience member applauds. Instead, Mason finds love, admiration, and strength from his family and community. As Fast As Words Could Fly could be used to introduce the history beyond the big demonstrations about the fight for civil rights. It would lend itself well to a group read and discussion, and could also be a wonderful source of prompts for writing from the perspective of different characters. For grade 3 and above. Book – Non-fiction. By Paula Young Shelton and illustrated by Raul Colon. 2009. 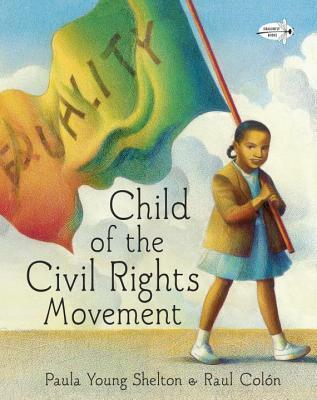 A child’s unique perspective on the Civil Rights Movement by the daughter of Civil Rights activist Andrew Young.